Home Attractions Exciting plans unveiled for Upper Precinct’s tranquil transformation. An oasis of greenery and water features are at the centre of a stunning scheme to transform the Upper Precinct. The exciting plans will involve creating large swathes of gardens, fountains and seating as part of a spectacular new public space. The proposals to create an open pedestrian area throughout the Upper Precinct have been submitted to Coventry City Council by Shearer Property Group and a fund advised by J.P. Morgan Asset Management. 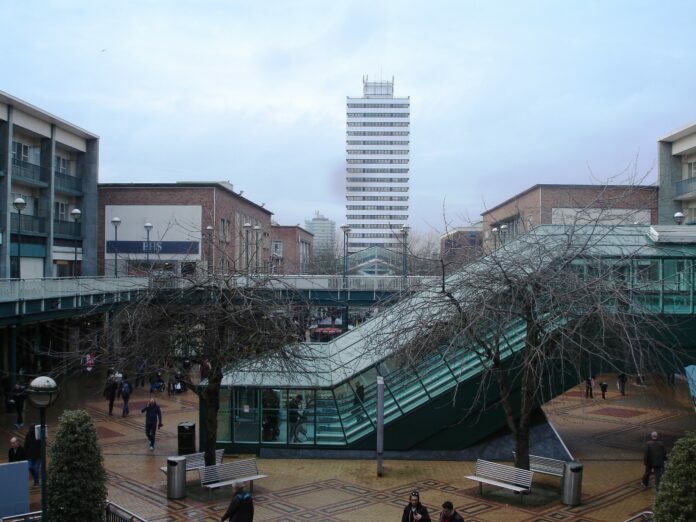 The ambitious scheme will involve removing the existing escalator and footbridges which connect the area to West Orchards Shopping Centre, re-establishing the view of the Cathedral. The application also seeks permission to remove the canopy outside the former BHS building. Street furniture will also be dismantled, including part of the ramp near Ernest Jones jewelers, creating an open space, introducing trees, plants and raised water features. The designs are completed by seating areas and timber terraces, along with a central pedestrian area in a framed courtyard style design. The project is being part-funded by £7.75 million from the Government’s Local Growth Fund through Coventry and Warwickshire Local Enterprise Partnership (CWLEP) as part of the overall £11.8 million scheme. The work is due to start in early autumn, removing the old underground toilet block, which was closed due to disrepair in 1999. Contractors will then proceed with the re-arrangement of shop units along the northern side of the Upper Precinct, accompanied by the drainage works to the main Upper Precinct area. Demolition of the footbridges will follow along with the construction of a new staircase to provide a new entrance into West Orchards Shopping Centre and the installation of new feature railings and lighting to the terraces on the first floor overlooking The Precinct. In order for the scheme to be completed and open ahead of Coventry being UK City of Culture 2021, work will continue at a steady pace to install the new paving, greenery, water features, street furniture and general landscaping. The new escalator is due to be installed in spring 2019. Cllr Jim O’Boyle, Cabinet Member for Jobs and Regeneration at Coventry City Council and CWLEP Board Director, said if the plans are passed, it would mean a new era for the Upper Precinct. “I’m really pleased that we are working with the private sector on this really important project. We’ve been really clear that this must be a top quality scheme – it’s what local people and the Upper Precinct deserve. In fact this plan is very similar to the original Gibson plan – and it will reintroduce water and greenery to the area. “It will also mean we can clear out some of the later additions that we know people don’t like – including the escalators into West Orchards Shopping Centre which have always divided public opinion. This will help to open up the view again towards Coventry Cathedral. “The pedestrianisation of Broadgate has been a huge success and we are keen to revitalise the Upper Precinct in a similar way. Previous articleBand Hatton Button law firm take on the Lake District’s 6 Peaks Challenge for Shine A Light support service.